A wire dachshund mix named Tippy saved my life when I was an infant. I must preface the telling of it with two items. First is how Tippy came to be a part of our family. My parents had been married less than two years and were living in Germany. 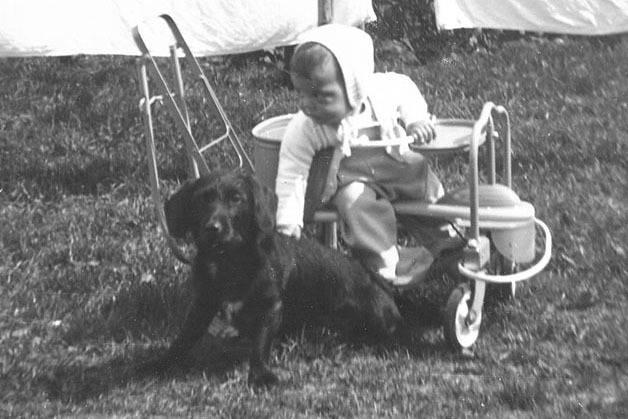 My mother was an animal lover and wanted a dog. 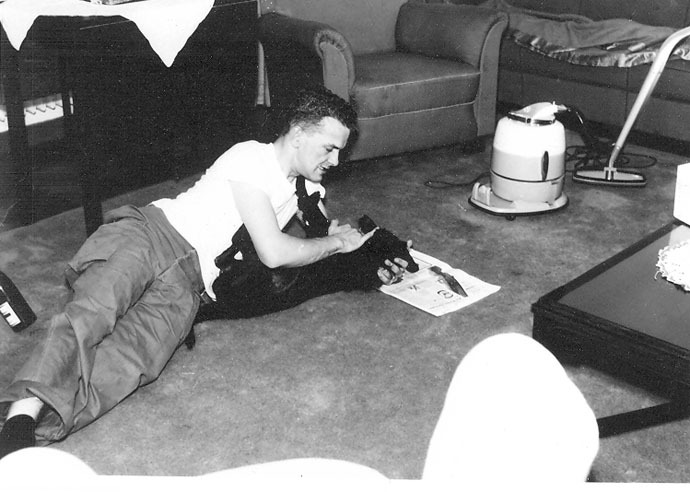 My father liked dogs but he'd grown up in rural Ohio with farm dogs that never got past the kitchen door. He did not believe dogs should live in the house. He didn't even think it was good for dogs to live in the house. He said that it wasn't good for their noses to always be smelling stuff like cooking fumes, cigarette smoke, and bleach. Anyway, he never wanted a house dog. But we had dogs the whole time I was growing up! So my mother went to a dog pound. I don't know whether it was a civilian German impound place or an American one on post. But she saw a Yorkshire Terrier there and thought that this dog was small enough that my father wouldn't object. Then she went home to talk him into it. Which she was able to do. But when she went back to the pound, the yorkie was gone. She was determined not to go home without a dog. So she looked for another small dog and saw this black wire-haired fellow that was part dachshund. She took him home and named him Tippy. This second item is only to indicate that I was pretty small which is pertinent, and that I already had a history of near-strangulation which isn't. I was due to be born July 19 in 1956. My parents were living in Frankfurt. My mother wanted to visit her family in southern Germany before I was born. They made the drive south to Pfaffenhofen which was my mother’s hometown in Bavaria. While they were there, my mother’s water broke. So I was born May 21 in the same small village hospital where my mother was born. I arrived something like eight weeks early with the umbilical cord wrapped very tightly around my neck. I was large (5 lbs 2 oz) for my stated (supposed ?) gestational age. My parents were told that if I had not been born when I was, I would not have survived cord strangulation. My mother said that the imprint of the cord was visible on my neck for a week after I was born. Of course, sometime later we had to make the trip back to Frankfurt. The doctor told them that I should not be exposed to any dust. So they had to keep me very well wrapped and the car windows rolled up the whole way and there was no air conditioning. She said it was a hot, really uncomfortable trip for us all. One day when I was still quite small, I was down for a nap and my mother was vacuuming. Tippy liked to watch at the window for my father who came home for lunch every day. Tippy would bark when he caught sight of him coming toward the apartment building. On this day, at near the time my father was due, Tippy began barking as usual. My mother didn't think anything about it. Only he kept barking. And barking. Eventually, my mother realized that something wasn't right and turned the vacuum off. Tippy ran back and forth from her to my room. She opened the door and saw that I had somehow gotten myself stuck between the bars of the crib. She said that I was past crying, that I was turning blue. She tried to get me out, then ran to the stairwell of the building and screamed for help. It took three people to get my head out of the bars. If I remember what I was told about this, my father arrived just about the time they managed to get me free. It was a traumatic experience for them. This is all I remember being told. We left Germany for Baltimore in 1962 whileTippy stayed in Germany with my oma and opa (my mother's parents). We saw him regularly again in the three years that we were back overseas 1965-1967. Tippy lived to age 16.